Beards are all the rage and it is a fashion trend I wholeheartedly support! But a word of warning fellas, with great facial hair comes great responsibility! Your beard care routine will depend on the length and style of your facial hair so we will examine a few options that you can try out! 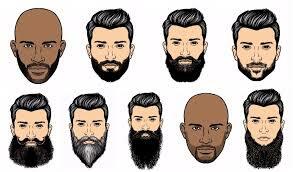 It is hard to know where to start with a new haircut and beards are no different, to the right is a handy chart that will hopefully help in deciding what kind of facial hair you would suit. Like choosing glasses it is all down to the shape of your face but whether you go for a Dali moustache or a full ZZ top beard good maintenance is the key. So you don’t fancy a wizard beards? Short beards and moustaches can be low maintenance and versatile, ideal for the man who dislikes spending hours grooming or who works in an industry where beards are perhaps not encouraged. Something to keep an eye on when it comes to keeping the shorter beards in check in the neck line, this is especially important if you are trimming yourself in the mirror. Aim for a wingers width above the adam’s apple. Attention to detail is paramount when it comes to keeping a short beard looking its best, we would heartily recommend visiting a barber initially (and regularly if possible) to help you by getting the shape started off. Then it is a case of keeping it neat with a good trimmer a steady hand. Another thing to bare in mind is keeping both your skin and hair in good condition. There has been a huge surge in the market for men’s skin care products that relate directly to shaving and beards. Pick up a good quality beard balm that has both the skin and beard hair in mind, or a good moisturiser and pair with a well fragranced beard oil. I know what you are thinking, why should you spend money on more products? You will thank us, seriously. Not only do the balms and oil leave your face smelling fantastic, but they help to soften the hairs, which in turn makes them less itchy. The balms help to soothe and moisturise your skin after shaving which also helps with any irritation also. Invest in a good quality product to really feel the benefits, the good thing about the oils especially, is that you only need a few drops at a time so a little will go a long way! Beards are all the range right now and the tips above should help you stay on trend, looking and feeling your best! Hello! The tips on beard styles are amazing. These are helpful for me as well as for those who want to adapt the stylish and glamorous look. Thanks and keep sharing.